The most menacing Pokémon of all can become quite game-breaking in the hands of savvy Smash Bros. players. 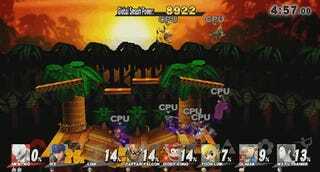 Following the early release of Mewtwo for Club Nintendo members, Smash Bros. players have found a curious bug that can transform Mewtwo into a god. 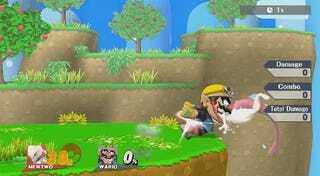 While Mewtwo does not have custom moves, players figured out that if you import a Mii onto your system, view them in the character select screen, back out, select Mewtwo, and choose “random,” Mewtwo will inherit the special moves of whatever Mii you viewed last. Unfortunately this inheritance isn’t perfect, and Mewtwo glitches the hell out. The result is a Mewtwo that can become invincible, invisible, or just plain unpredictable. If that last GIF seems absurd, that’s because it is. This glitched Mewtwo has its attack hitbox span the ENTIRE STAGE. So it can hit enemies no matter where they are, all at once. Bananas. 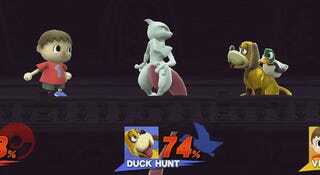 The drawback is that its hurtbox also spans the entire stage—so anyone can easily hit Mewtwo, too. People who are using these exploits say they can’t be used online, but even so: wow! Hopefully this gets fixed when Mewtwo gets a wide-release.